Bearded dragons exhibit a variety of behaviors. Recognizing what behavior your beardie is exhibiting and why they are showing this kind of behavior is important to truly understanding your pet. It is also helpful to know what behaviors are normal and which ones are signs of stress or illness. Young bearded dragons may do a slow "wave" with one of their arms to signal, "I'm just a baby! Don't hurt me!" Your young beardie may even do this when he sees you walking up to him if he is intimidated by you but they usually do this to older bearded dragons who they don't know very well. When bearded dragons feel they have dominated something or someone they may bob their heads. This is literally what it sounds like - they bob their head as though they were saying "yes." More dominant beardies may do this in passing to younger beardies. 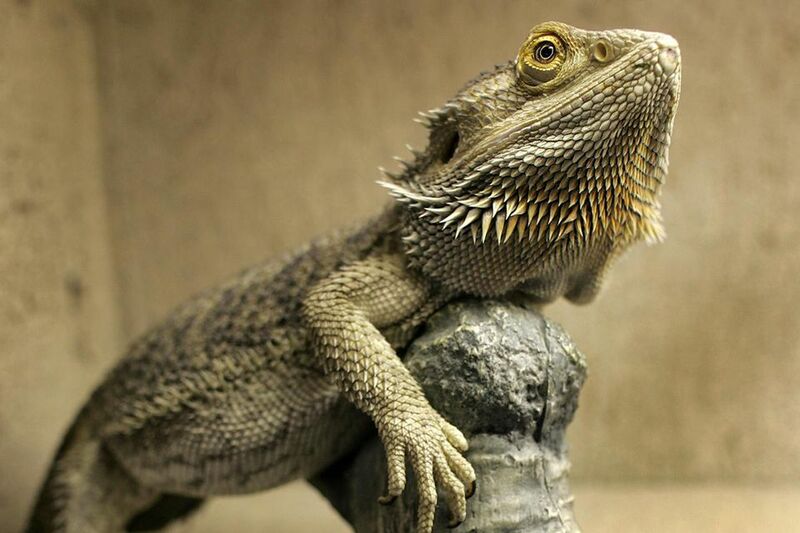 Younger bearded dragons may do "the wave" while the older or more dominant dragon may concurrently "head bob." Bearded dragons get their names from the area on their throat where a human might have a beard. This "beard" can be puffed out and darken all the way to black on demand when your beardie gets upset. He may also choose to puff and darken his beard if he feels threatened, isn't feeling well, or if he is trying to display dominance (often done during mating season to impress the ladies). Overall body color changes and beard color changes may occur slowly as your bearded dragon grows but if a sudden or temporary color change is noted it is due to stress, illness, or an emotion. Beardies will often darken or turn black if threatened or upset. They will also darken their beards while exhibiting the beard puff. Most bearded dragons will change colors and darken when brought to their exotics vet if they aren't used to traveling (keep your beardie warm on the way to the vet) or handling. This is a strange behavior that bearded dragons exhibit in times of boredom and stress. Beardies will run back and forth alongside their enclosure (often a glass tank) and stand on their hind legs trying to run up the side. It looks comical and you may even think your beardie is playing or sees his reflection in the glass but he isn't doing this for fun. If your beardie is glass surfing he may need a larger enclosure, more playtime outside of his enclosure, or something else is stressing him, such as a pet cat staring at him or the loss of a cage mate. Glass surfing should be considered an abnormal behavior and beardies can actually hurt themselves by rubbing their feet, bellies, and faces on the glass repeatedly. Female bearded dragons may naturally burrow if they are trying to lay a clutch of eggs. In the wild, beardies cover their eggs to incubate them and keep them safe from predators. In captivity, they shouldn't have to worry about the predators, but most bearded dragon breeders will remove the eggs after they are laid and incubate them at controlled temperatures in incubators. If your beardie is digging, be sure to provide the appropriate substrate so that she can lay her eggs, make sure you are offering enough calcium in her diet, and monitor her eating and activity levels carefully. Many bearded dragons become egg bound and need assistance or surgery to remove all of the eggs from their bodies. Brumation is like hibernation for reptiles. Some reptiles in the wild will brumate when the weather gets cooler and food is more scarce. In captivity, temperatures are controlled and food is always available so brumation is not necessary. If your reptile isn't eating, moving much, burying himself, and defecating he or she may be trying to brumate. Make sure you contact your exotics vet to make sure your beardie isn't sick or dying but this can be a completely normal behavior - and a behavior that is alright to allow in healthy bearded dragons.